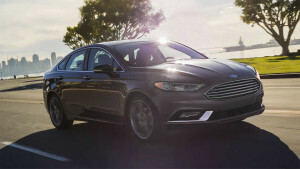 The 2017 Ford Fusion has rapidly become one of the most coveted mid-size sedans in this region. The way it expertly handles varying terrains while still remaining budget-friendly is both unique to the automotive industry and desirable to responsible drivers. EcoBoost® engine options form a powerful core, that, when combined with Intelligent AWD, make it quite a formidable vehicle throughout tough or unpredictable conditions. Additionally, hybrid options, great fuel mileage, and hi-tech details, show off how eco-friendliness can still produce a standout automobile. Read on for more information about about the terrific 2017 Ford Fusion performance features. The 2017 Fusion’s Intelligent AWD is a force to reckon with. It appropriately distributes torque, and applies the necessary traction for smooth and steady maneuvering. It’s the perfect compliment to the Sport trim’s 2.7L engine, and the 2.0L engine in the Platinum, SE, and Titanium trims. Auto Start/Stop: Gone are the days when you worried about the engine idly running while stuck in traffic, or waiting for someone. Best still, only the engine is stopped, so you can still enjoy music and climate control. Hybrid and Plug-In Energi Trims: Four Hybrid and three Energi Plug-in trims still come in under the $40,000 MSRP, which further adds to these selections’ value. Stop by Glenwood Springs Ford, and experience the 2017 Ford Fusion performance features for yourself! You can also message us online, or call us at 970-945-2317, and to let us know you’ll be by to check it out!